Join CEJC for Our Statewide Conference for Environmental & Climate Justice! 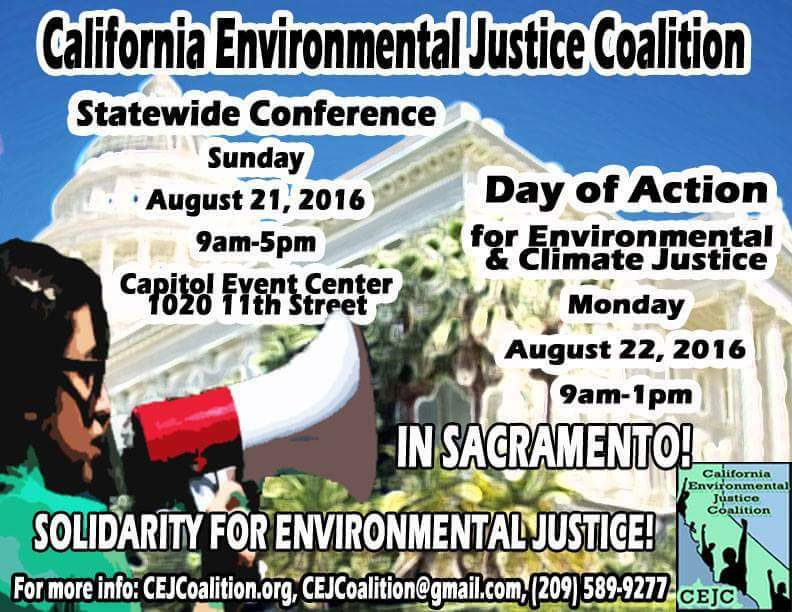 The California Environmental Justice Coalition is pleased to announce our statewide environmental justice strategy conference, trainings, and day of action taking place on August 21-22, 2016, in Sacramento, CA. Join grassroots groups from Environmental Justice communities from around California for this statewide strategy conference, trainings, and a day of action for environmental and climate justice. Sunday, August 21, 2016: The statewide conference/strategy meeting will be at the Capital Event Center in downtown Sacramento. This day will include strategy sessions as well as trainings to build the knowledge and capacity of grassroots groups. Monday, August 22, 2016: On Monday morning we will visit legislators and other officials at the Capitol to speak to them about our issues and legislation that the coalition supports or opposes before we take further action for environmental and climate justice. IF YOU PLAN ON ATTENDING THIS MEETING, PLEASE PREPARE A TYPED STATEMENT OF YOUR ISSUES YOU WISH TO BE ADDRESSED ON YOUR ORGANIZATION’S LETTERHEAD TO PRESENT AND GIVE TO OFFICIALS (WITH UP TO 25 COPIES TO DISTRIBUTE).